How the Menace Emerges: An unsolved mystery. Why now? Who knows? Not even the townsfolk of River Falls care. Earth vs. the Spider another installment in a lifetime of big critter flicks from Mr. B.I.G., Bert I. Gordon, master of 50s gigantism. In true b-movie fashion, he plugs his own flicks on the marquee in town more than once. Mr. B.I.G. and American International were known for their capacity to seize upon a current fad and churn out a low-budget response in a jiffy, and this is no exception. This was another gigantic critter flick for the teen crowd, with nothing deeper than turning a dollar at its core. Although some of the “teens” are at least 30, the acting is tolerable enough and Earth vs. the Spider rolls along well, without ever slowing to a crawl. Of course, all attacks are off-camera, but there a little gore and rear-projection solves nearly all of the budget problems. Even some of the non-spider shots are classically creepy, like the post-rampage footage of suburban destruction and a blood-spattered toddler crying in the street. The spider is very spidery, since it’s the real deal throughout most of the film. For the most part, it’s integrated pretty well into its larger landscape, if you can overlook the size changes it goes through. There are even shadows drawn onto the ground sometimes, in a touching attempt at realism. The voice of the spider is top-notch, over the top and very human. I swear it’s saying a garbled “home” as it crawls back into its cave. 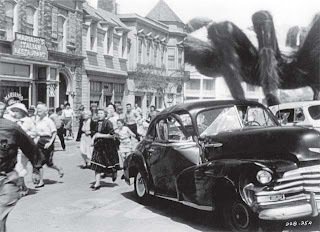 Plausibility needs to be tossed out the window when walking into a giant critter attacks movie, so there’s no need to harp on the many implausible story developments. Instead, there’s a bunch of absurd twists to provide tension or a cheap gag. Earth vs. the Spider is nothing more or less than a fun romp through cheap b-movie territory. Enjoy. Nit-picking Science: Professor Kingman, insects? Spiders aren’t insects!